TONY Blair paid a sneak visit on Monday to the University College Hospital London where an operation has been named after him. Blair had had the 30 minute procedure – which consists of running a microscopic cable through to the heart and shocking it into a regular rhythm – a couple of years ago at the Heart Hospital in Marylebone now owned by the UCLH. 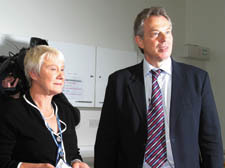 Was it a sentimental trip back to the UCLH by Blair on Monday? I wouldn’t have known of the visit if I hadn’t gone there to interview a member of the staff about another story altogether. Then I saw armed policemen in the foyer and a green ministerial Jag parked at the back. A nurse whispered that Tony Blair was in the radiography department in the basement. It turned out he wanted to stress how – thanks to government investment – patients can now be guaranteed an operation within three weeks if a cancer is spotted by a radiographer. He said people can take a pop at him over the NHS but he was proud of what had been achieved through the changes made in these tests. Staff told him that waiting times for cancer services had fallen from eight weeks for treatment to just over three weeks at the UCLH. “This is a benchmark for cancer care in the NHS,” he said. But 24 hours later, hospital staff demonstrated on the steps of the foundation trust to complain about public sector staff pay rises. Hospital workers have learnt they will be awarded a pay rise of 1.9 per cent. Banners called on Pm-in-waiting Gordon Brown to rethink pay deals. BEHIND Pat Nightingale’s quiet personality lay a probing intellect which set her apart from many of her colleagues at the Town Hall. She was one of those people whose reserved character belied great courage. This was demonstrated when she had to face the cancer from which she eventually succumbed on Monday. But those who keenly observed her in the 90s on the council as a Labour member would have recognised that she could be a formidable opponent. If challenged, her principles were put first, whatever the cost to her political career. What an exceptional politician. When the Labour group were being harried by its leaders to expel an awkward councillor, Ernest James, it was Pat who spoke up for him at a stormy meeting, while many of his supporters sought sanctuary in silence. Pat would never show off her intellect but those who got to know her were aware of her passionate interests in politics and the arts. Born in Preston she won a place at Durham University and was highly regarded. Latterly, she worked as a manager at Cecil Sharp House in Primrose Hill where she dealt evenly with artists of all levels, among them, the great tenor Pavarotti who negotiated with her to use the hall for rehearsals. Another former councillor, Jim Turner, of a similar hue, also died on Friday. Jim was an honest, working-class fellow who was drawn naturally to Labour politics, and whenever he felt his political principles were under threat at the Town Hall, he could always be relied on to vote on the side of the angels. Old-style politicians like Pat and Jim are getting rarer and rarer in these days of spin and passionless politics. SHE turned her back on Hollywood many years ago to live on a Welsh farm and it seems that sixties screen icon Julie Christie (above) has no desire to return to the public eye. The luminous star of Darling and Don’t Look Now, now a graceful 66, made a rare appearance at the Screen on the Hill in Belsize Park on Friday to discuss her latest film, Away from Her. Asked how she’d feel if the film – a delicate drama about the impact of Alzheimer’s – propelled her into the spotlight once more, she was categorical. Although she had a challenge for one audience member bemoaning the lack of “good contemporary political films”. “You write it and I’ll do it,” she told her. I couldn’t spot Julie’s close friend journalist Duncan Campbell at the cinema. She and Duncan have had a relationship for nearly 30s years, and are still as close as ever. Duncan began his career on the defunct listings magazine City Limits. Later he moved to The Guardian where today he writes a column. Karl, who built his reputation as a writer on folk music from the 60s to the 90s, lived for many years in Gordon Mansions, Bloomsbury, before moving to Yorkshire. He will be beating the drum at Marx Memorial Library in Clerkenwell on Monday evening.